Our ambassador fishing cat Minnow passed away last week at 12 years old. Like many feline species, including the domestic housecat, Minnow struggled with renal disease in her older age and in the end, renal failure. While 12 years old may seem young, fishing cat average lifespan is about 10-12 years old and Minnow lived a full life with us at the Cincinnati Zoo in the Cat Ambassador Program. 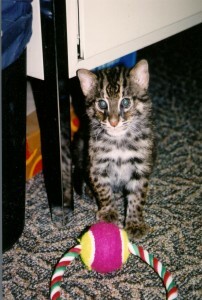 Minnow came to us at 16 days old from the Exotic Feline Breeding Center in CA. 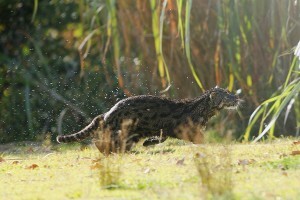 It is rare to see fishing cats in zoos and even more rare to see an ambassador fishing cat. 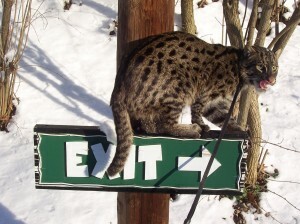 In fact, Minnow was the last working ambassador fishing cat found in any Association of Zoos and Aquariums (AZA) zoo. We were fortunate that she was given to us because her genetics did not match with the SSP (Species Survival Plan) population. Since she would not be fit for breeding we were allowed to try to raise her as an ambassador cat. I say “try” because fishing cats are quite a challenge. In the wild, they are very rare and elusive and in captivity they behave as their wild counterparts, aloof to their keepers and reluctant of any changes in their environment. The Cat Ambassador Program staff took on Minnow and met the challenge. In her early years Minnow was one of the stars of the travelling Cat Ambassador School Program. Trainers would take a small water tub and Minnow would show off her fishing skills for thousands of children a year across Ohio, Indiana and Kentucky. In 2007, when the Cheetah Encounter Show yard was built at the zoo, the trainers insisted on having a deep pond, to give Minnow a chance to show off her natural behavior for guests at the zoo. True to her cautious species, Minnow was not immediately a fan of the pond and of the large wide open space in the new yard since fishing cats live in marshlands in Southeast Asia and are nocturnal. It took a full year of training with Minnow for her to be comfortable fishing in the pond and appearing reliably in the show. Between 2008- 2015 Minnow appeared in the summer Cheetah Encounter Show. She appeared on sunny warm days and on days when she was interested in participating. While she loved to fish, she was after all, a wild fishing cat, and life moved on her terms. Fishing cats are not well known so many visitors were surprised to see this small black and gray cat diving in head first into a pond. There were many “oohs” and “aahs” when she performed her “high dive” behavior – leaping off a platform and diving into the pond after a fish. She was a great addition to the show, giving us the opportunity to talk about the diversity and uniqueness of cat species around the world. People also loved to see her slink down into the short green grass, pretending to camouflage, as she ignored her trainers requests to retreat out of the yard. She was a small cat with a big attitude. An attitude that while sometimes tough to train was the mark of her species. As animal trainers we learned so much from Minnow. She taught us how to work with and not against natural behavior, how to give an animal time and space when it needed it, patience, perseverance when training a “difficult” cat and above all, more patience. As with all our ambassador cats, our constant hope is to inspire visitors to learn more about the species we share. Minnow was no exception. We hope that the hundreds of thousands of visitors that saw Minnow at a school program or at the zoo were inspired to learn more about her species and how their daily actions can help her native cousins in SE Asia. Minnow inspired me personally as well. Last year I took on the role of Education Advisor for the Fishing Cat SSP (Species Survival Plan). I created a Facebook page , where Minnow is often the subject, and started to work on collaborating with fishing cat researchers across SE Asia to learn how we can do more. In the last year we have organized fishing cat fundraising events through our American Association of Zoo Keepers (AAZK) chapter in Cincinnati to support conservation research and as I write this I am preparing to travel to Nepal next week, to meet in person with researchers from around SE Asia at the first ever Fishing Cat Symposium. 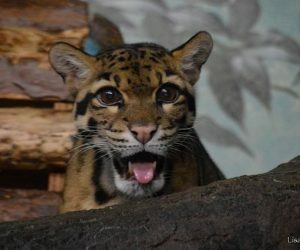 My hope is to come back with specific knowledge about the plight of the fishing cat and how we can help from across the globe, to make a difference for this unique and endangered species. My love for fishing cats started with Minnow but it has now extended beyond her, and I am committed to global fishing cat conservation because of her. While Minnow may no longer be around physically, she will always be in our hearts and minds. She was a unique and dynamic individual and the bond that we formed with her can never be forgotten. 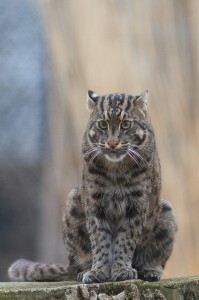 We will carry forth her memory as we continue to educate and inspire visitors at the Cincinnati Zoo and beyond and we will continue to work to preserve all endangered cat species, including the fishing cat. Goodbye sweet Minnow- we are forever grateful for the 12 years you were with us. Thank you for letting us into your fishing cat world. you will be missed. I have my baby pictures of you and our trip to New York as a baby to forever remember. I am so saddened to hear of Minnow’s passing. A few years ago, my children and I were able to see Minnow playing with and eventually catching live fish in the cat house. It was by far the most incredible thing I have seen at the zoo! Fishing cats doing what they do best! Every trip since then, we would look for her to see if she was fishing. We unfortunately never witnessed it again. Thank you for giving us such a memorable experience with an amazing animal! So sorry to hear about Minnow’s passing. My heart goes to her keepers and Linda! 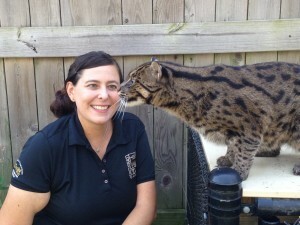 I know that the zoo and staff will continue to take amazing efforts to saving Fishing Cats in the wild. It was always a treat to see Minnow do her thing during the Cheetah encounters! Thanks for the fond memories! I was saddened to hear about Minnow passing. I was just curious ( my need to know trivia mind never stops ) what happens to the animals when they pass at Cincy Zoo or any Zoo for that matter ? Sorry to hear about Minnow’s passing. I enjoyed seeing her at the Cheetah encounter. She’ll be missed! I’m so sorry to hear this! She will be missed – I’m so grateful to the Cincinnati Zoo for sharing her with us and the care they have taken with her! We love you guys!! What a beautiful and moving tribute. Thank you for your efforts to bring this amazing species to the spotlight. I am truly saddened to hear the news of Minnow’s passing. I loved that silly little cat. Some of my best memories are of her learning to “fish” for toys in the bathtub! She was a great ambassador for her species. I enjoyed being part of raising her and caring for her in the cat ambassador program. She will be greatly missed. Thanks for this fine tribute to Minnow. We always enjoyed seeing her at the Cheetah Encounter show. She was truly an ambassador for her species. 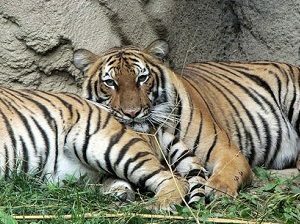 Thank you for your great work with all of the zoo’s cats! So sorry to hear of her passing, but she did live a long life as you pointed out. So sad to hear of Minnow’s passing. This was a lovely tribute, and I hope her legacy is more awareness and support for protecting her species in the wild. It breaks my heart to hear of Minnow’s passing. For more than two years now my daughter, who has always loved cats of all sizes, has been obsessed with Fishing Cats. She spent a year or so convinced that she was a Pampas Cat. One day she said that she wanted to teach the cats to swim. I told her that cats don’t like the water and she responded “Don’t you remember the Fishing Cat at the zoo?” She was 3 and has been a Fishing Cat in her heart ever since, thanks to Minnow! Beautiful tribute to a beautiful feline. We’ve always loved the cat exhibits at the zoo, and the fishing cat exhibit has and will always be one of my absolute favorites! Very sad to hear. Fishing cats are so rare, it was always exciting to be able to watch one at our zoo. Small cats rock! Your tribute to Minnow gave me such fond memories. She will be missed but we were blessed to have her at the Zoo. 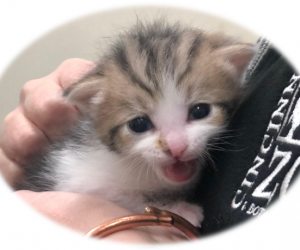 Do you foresee the day when another fishing cat kitten will join the program? Lovely story. I too am a fan of fishing cats and would love to help them more from my base in Australia. I will surely miss seeing Minnow’s diving skills when I visit the Cheetah show again.